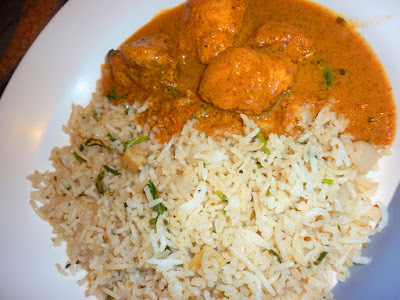 Butter Chicken with Jeera(Cumin flavored) Rice. Butter chicken is one of the most popular dish from India. Silky,creamy gravy with boneless chicken pieces.What else you can ask for!This sinful curry has always been one of the kid's favorites. You can get thousand's of recipes for butter chicken on the internet with slight variations.But this recipe of mine is really simple ,developed by sheer experimenting.I can guarantee that the taste is just the same as the one you get from restaurants. Lightly fry this in 1 tsp butter.Keep aside. Make a fine paste of onion and green chili. In a sauce pan,melt butter.Add in ginger garlic paste.Fry it until light brown.Now saute onion paste for 3 minutes.Now saute 1 cup tomato puree.Add salt,red chili powder,cumin powder,coriander powder. Add yogurt into this and saute until oil separates.Add the chicken pieces. Now add in 1 tsp sugar and fenugreek leaves(Kasuri methi). Add in enough water for a thick gravy . Boil until chicken is well done and the gravy starts thickening. Finally add 2 drops of food color if you feel the gravy is not very reddish. Enjoy this silky creamy butter chicken with cumin rice.Recipe is coming soon. Butter chicken looks superb yummy. One of my fav curry...looks delish Deepa.. Very invitingly Good n Creamy Butter Chicken Curry Dear.Fabulous recipe. Everyone's favorite dish... Love the color, looks delicious..! So creamy n yummy butter chicken. oh....this dish looks so tempting! Loved the colour too!